"Assateague" redirects here. For other uses, see Assateague (disambiguation). 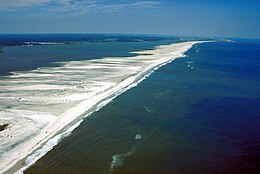 Aerial view of Assateague Island. Ocean City, Maryland is visible in the far distance at top. View is to the north. Assateague Island is a 37-mile (60 km) long barrier island located off the eastern coast of the Delmarva peninsula facing the Atlantic Ocean. The northern two-thirds of the island is in Maryland while the southern third is in Virginia. The Maryland section contains the majority of Assateague Island National Seashore and Assateague State Park. The Virginia section contains Chincoteague National Wildlife Refuge and a one-mile stretch of land containing the lifeguarded recreational beach and interpretive facilities managed by the National Park Service (or NPS). It is best known for its herds of feral horses, pristine beaches, and the Assateague Lighthouse. The island also contains numerous marshes, bays, and coves, including Toms Cove. Bridge access for cars is possible from both Maryland and Virginia, though no road runs the full north/south length of the island. The National Park Service allows off-road vehicles with permits in certain areas. A large number of visitors travel to the island to surf fish during the striped bass migration. On the Maryland side, only 145 vehicles are permitted on the beach at any given time. Sections of the beach are periodically closed to protect wildlife, or after storm damages, amongst other reasons. Car camping sites are available in both the National Seashore and Assateague State Park by reservation. Backcountry sites are also available from the National Seashore. There is no camping available from the Chincoteague National Wildlife Refuge. Pets are prohibited in all areas except certain parts of the National Seashore and parts of the state park. Kayak touring is a popular way to see the wildlife, especially on the calmer bay side. The best times to backcountry camp are in the spring and fall. Summer months are known for heavy mosquito populations, particularly on the bay side. Humans and horses are often brought into proximity on the island. Assateague State Park comprises almost 800 acres (3.2 km2) and lies in Maryland within the National Seashore. The state park is the most developed area on the island with 350 campsites. Most of the water around the island is within the boundaries of the national seashore. The island has a land area of 24.4 square miles (63 km2) and has no resident population in either Maryland or Virginia, though a few retained property rights until 2006. These were mainly hunting camps. The Maryland and Virginia horses are kept apart by fencing at the border between the two states. Though commonly called "wild," these horses had domesticated ancestors, claimed in legend to be survivors of a Spanish galleon that shipwrecked along the coast, but possibly just local colonial horses allowed to run loose. When excess numbers are removed from the island and they are placed into human ownership, they adapt quickly to domestication. Made famous by Marguerite Henry in her children's book Misty of Chincoteague, the animals are popular tourist attractions and subjects for photography. The Maryland horses are owned and managed by the NPS, who have carefully followed the population over generations. 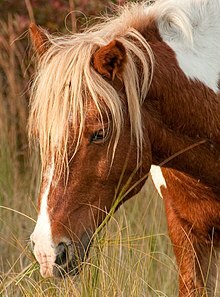 In Virginia, the Chincoteague ponies are owned by the Chincoteague Volunteer Fire Company. Once a year in July, the local "salt water cowboys" round them up and sort a number of animals to be removed from the island, which are put up for auction on Pony Penning Day. Saltwater cowboys round up ponies on Assateague and herd them down the beach at sunrise. To keep their numbers under control on the Maryland side, a federal contraceptive program has been in place since 1994. In Virginia, the Pony Penning Days auction keeps the horse population at levels required by agreement with the Chincoteague National Wildlife Refuge. ^ Kenney, Nathaniel T. "Watermen's Island Home", National Geographic, Index (January–June 1980), vol 157 (June 1980): 812. ^ Turner, John and Jay Kirkpatrick. Field Guide to the Assateague Ponies. Toledo, Ohio 1988. ^ GMCO Maps & Charts. GMCO's Fishing & Recreation Map of Chincoteague-Assateague, Virginia, 2003. ^ a b c Williams, Jeff. "USGS Research Contributes to Assateague Island Restoration—Mitigating 70 Years of Coastal Erosion Due to Ocean City Inlet Jetties". Sound Waves November, 2002. Accessed online December 3, 2010. ^ Masterson, John P. Development of a Numerical Model to Simulate Groundwater Flow in the Shallow Aquifer System of Assateague Island, Maryland and Virginia. Reston, Va.: United States Geological Survey, 2013. ^ "Surf Fishing on Assateague Island by Truck". HawgStalker.com. 2019-03-19. Retrieved 2019-03-28. ^ United States Fish and Wildlife Service. "Species Profile, Piping Plover (Charadrius melodus)". USFWS. Retrieved 2014-01-16. ^ "XmACIS2 - NOAA Online Weather Data". National Oceanic and Atmospheric Administration. Retrieved January 16, 2019.